A bunch of believers are getting healthy in their eating. Here's a tool for these folks. I just got mine! 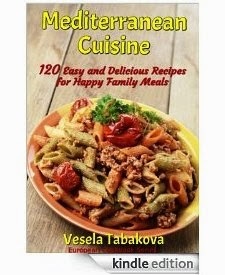 A zestful cookbook inspired by the fresh, healthy, and delicious dishes of the Mediterranean diet. From strawberry jam crepes to ground beef chickpea casserole, these are the recipes your kitchen can’t do without! Cooking and eating the Mediterranean way is healthy and rewarding because food is prepared with pleasure, passion, and lots of fresh ingredients - fruit, vegetables, legumes, grains, nuts, healthy fats and aromatic herbs and spices. The health benefits of the Mediterranean diet are well known, proven with research and hard to ignore. A recent, large study of 7,500 people in Spain found that following a Mediterranean diet can cut the risk of heart disease-related deaths by about 30 percent compared to a typical Western diet. Changing your food habits and eating the way people in the Mediterranean do will greatly improve your health and you would be less likely to develop high blood pressure, high cholesterol, or become obese. If you want to change your eating habits for good and at the same time reduce grocery costs, try some of my Mediterranean Recipes. You will impress your family and guests, and best of all, you will soon look and feel younger and healthier. From a 5-star review: “A lovely cookery book packed with recipes for colorful dishes from the Med. What I particularly like about it is that it includes recipes from all over the region, so you can sample food from different countries and decide for yourself which suits your palate best.